Our box of produce this week contained no stone fruit or summer squash. But it did contain grapes, Asian pears, and spaghetti squash. Wait, what?! Isn’t it still August? Don’t we still have some lazy summer left? I’m not ready to trade in tomatoes and basil for rutabagas and rosemary. I’m not in the mood for soups and stews, I’m still enjoying salads and barbecues. I’m not sure what’s happened to me this year. I’m normally ready to be done with summer as soon as we have our first hot day in May. Seriously. Not a fan. 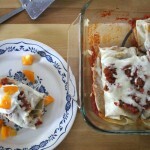 My main concern is that I will be missing the summer fruits and vegetables that I’m so very fond of. In an effort to make some more fall and wintery foods seem summery, I’m gonna compromise. I’ll roast spaghetti squash, sure, but it will be with things like summer squash, tomatoes, and basil. I’ll keep potatoes away from the masher and roast them with a spritz of lemon and some bright herbs like basil and parsley. And I will pop some of the grapes into the freezer, for a hot afternoon’s snack. Summer can stay for a while… but not too long. I’d like it cool by September, please. Drizzle squash with olive oil and a sprinkle of salt and pepper. Place cut side down on a baking sheet. Bake on a rack set in the middle or upper position of the oven, for 55-65 minutes, or until flesh of squash is tender (jab it with a fork to find out if it is). Heat pan, add ground meat. Drain fat and return meat to pan. Add veggies, herbs, salt and pepper. (Add some olive oil if the pan gets dry.) Cook until reduced and saucy, about 13 minutes. Add red wine vinegar, cook 2 min more. Remove squash from the oven. Scrape with a fork to get the spaghetti-ness from the side. Fill with meat and veggie mixture. Top with parmesan cheese, basil, and a drizzle of good quality olive oil (like Bari's). Serve with garlic twists or garlic flats. 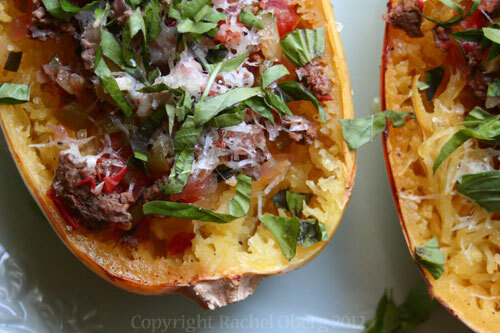 To serve more than two as a main dish, add another spaghetti squash. There should be enough filling for 4 people.